The Sixth Tbilisi International Piano Competition was held on October 1-11, 2017. Due to the results of Preliminary Audition by CDs 31 pianists from 14 countries were selected to participate in the competition. 17 participants from 11 countries took part in the competition. Drawing of lots was held in the Foyer of the Conservatoire Grand Hall on October 1, 2017. The Festive Opening Ceremony of the competition, held on the same day, was followed by Inaugural Concert "New Generation" which featured young talented Georgian pianists, laureates of International compettiions: Giorgi Grdzelidze, Mariam Muchiashvili, Davit Khrikuli, Sandro Nebieridze. The concert was held on YAHAMA concert grand piano. The Finalists, in the Fourth Round, were accompanied by the Tbilisi Symphony Orchestra, Conductor - Volodymyr Sirenko (Ukraine). Closing Ceremony & Prizewinners' Gala concert was held on October 11, 2017. The Conservatoire Grand Hall was built in 1938-1941, when the conservatoire building was undergoing its first reconstruction (Architect: Shalva Tavadze). It was festively opened on January 28, 1942. In 1963 a three manual and forty register “Alexander Schuke Potsdam” organ was installed in the Grand Hall. Its timbre and register specifications were perfectly adjusted to the Hall’s acoustics. Over the years famous organ players such as Isay Braudo, James Dalton, Jean Guillou, Garry Grodberg, Hugo Lepnurm and Leonid Roizman have performed on this remarkable instrument. Renowned Georgian organ player Eter Mgaloblishvili’s career is also inextricably linked with this organ. During ten years, (1987 – 1997), the Grand Hall did not function. On Manana Doidjashvili’s initiative and the Georgian government’s support the Hall has been restored and renovated, in the result of which the Hall has once again become a very significant cultural center for our capital. In 1998 the Georgian Parliament together with the Republic of Germany restored the organ. The Grand Hall has a seating capacity of 500; it is remarkable in terms of acoustics and can host both symphony and chamber concerts. The orchestra pit makes it possible to perform operas there as well. The Hall has digital audio-recording studio, organ, two “Steinway & Sons” concert grand pianos and all facilities which meet modern standards. Since 1997 the Grand Hall has hosted annual international festival New Year Music Celebrations. They feature outstanding contemporary musicians performing, classical and folk music, as well as jazz. The Grand Hall hosts various cultural events like the Georgian Competitions of Musician-Performers and the Tbilisi International Piano Competition, International Symposia on Traditional Polyphony, as well as book presentations, exhibitions of paintings etc. Volume II: C- sharp minor, D major, D- sharp minor, E major, F- sharp minor, G minor,G -sharp minor, B- flat minor, B major. 4. One work at the competitor’s choice. R. Schumann, F. Chopin, F. Liszt, J. Brahms or C. Franck or S. Rachmaninov. Program must include works of diﬀerent styles and epochs, the 20th century music among them. Concertos in: B flat major. K 450; in G major. K 453; in B flat major. K 456; in D minor. K 466; in C major. K 467; in E flat major. K 482; in A major. K 488; in C minor. K 491; in C major. K 503; in D major. K 537; in B flat major. K 595. Mr.Gyoten IASUAKI – executive director of Yamaha Music Gulf FZE & IMTC MUSIC. To share prize/prizes except Grand Prix First Prize among the established number of finalists. No Member of the Jury may present a competitor who has been his/her student during the period ending 3 years prior to the Competition (2015-2017). All decisions of the Jury will be final and beyond appeal. Recital in Utrecht - organized by International Franz Liszt Piano Competition, Utrecht, (The Netherlands). Recital in Kiev– organized by International Competition for Young Pianists in Memory of Vladimir Horowitz (Ukraine). City Hall of Tbilisi Prize - For artistry - bronze statuette "Magic Note" - Daumants Liepiens (Latvia). Ministry of Culture, Monuments Protection & Sports of Georgia Prize – For the best recital in the Semifinal - gilt bronze figurine "Muse" - Tian Yi Li (China). Ministry of Foreign Aﬀairs of Georgia special Prize– For the best foreign performer of a Georgian Composer’s work – 1.000 US Dollars - Anastasia Rizikov (Canada). Embassy of Norway in Georgia special Prize - For the Best Performer of a Classical Sonata in the Second Round - 1.000 US Dollars - Andrzej Wiercinski (Poland). Embassy of Poland in Georgia special Prize – For the Best Performance of a Chopin Etude - US $ 1000 - Ryutaro Suzuki (Japan). Embassy of Italy in Georgia special Prize – For the best performance of a Scarlatti Sonata - US $ 1000 - Tian Yi Li (China). 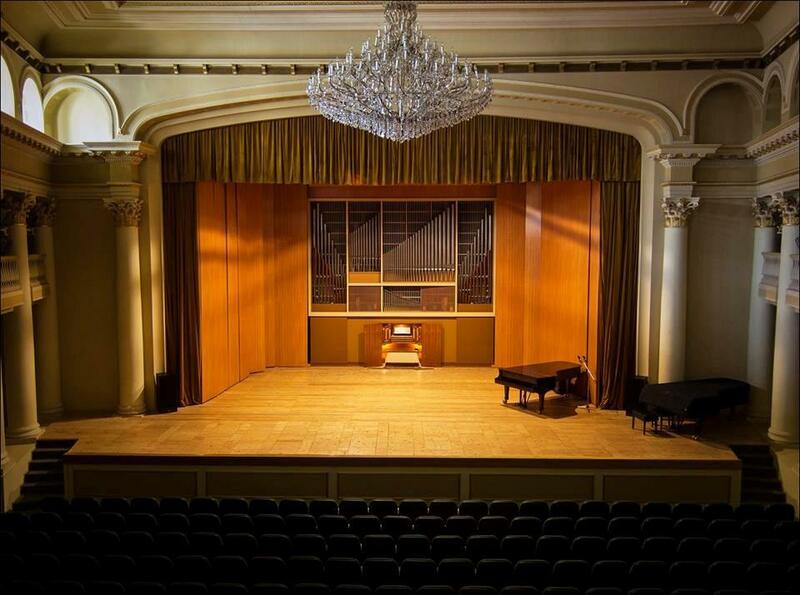 Embassy of Turkey in special Georgia – For the best performance of piano concerto - US $ 1000 - Giorgi Gigashvili (Georgia). Annarosa Tadei's special Prize awarded by The Georgian Music Competitions Fund - For the Best Performer of Romantic Music – 1. 000 US Dollars - Tian Yi Li (China). Liza Leonskaja special Prize - For the Best Georgian performer – 1. 000 US Dol-lars - Giorgi Gigashvili (Georgia). Maia Adamia-Griffin special Incentive Prize - For the best Semifinalist not admitted to the Final - 500 US Dollars - Ryutaro Suzuki (Japan). Conservatoire Grand Hall Prize – CDs for all Semifinalists with a recording of the Third Round. Here, at the Tbilisi Competition, standards are extremely high. It is not easy to be admitted to this competition because of its prestigious reputation. We have a similar competition in Spain, which I am the chairman of, and I can boldly say that we do share values and views. The repertoire of the contestants clearly speaks about their soul and inner world and not only about their technique. There is an excellent working atmosphere; I feel at home in Georgia. I am fond of this competition. Organization is incredible, which is rather important. Amazing jury and competitors have gathered this year. This competition is one of the major ones in the world. Supposedly, I will come back as a jury member. I fell in love with your city, I find the night lightnings the most appealing. Atmosphere is exceptionally warm both within the frames of the competition and in general. The Sixth Tbilisi International Piano Competition was notable for several aspects; This year, the competition celebrates its 20th anniversary since the foundation. For the first time, throughout these years, each participant had the opportunity of playing two rounds through, which resulted in revealing semifinalists. Unprecedentedly young group of competitors were admitted to the finals (the eldest was 23) and to my greatest regret, the jubilee competition was marked by a small number of the Georgian contestants (3 in total). We’ve had the pleasure of hearing many interesting and gifted young musicians who completely differed from one another. Hopefully, names of our laureates will soon appear on the major stages of the world and they will gain an international recognition in the nearest future. I am thrilled to realize that the competition, founded 20 years ago, still retains its values. In 1997, when establishing this competition and restoring the Conservatoire Grand Hall we witnessed a cultural revolution. This served as a reason for some serious shifts. A number of talented pianists were discovered, who, nowadays, are performing worldwide.The competition is assembled like a score by Mozart; Organized perfectly. Considering their young age, I am truly amazed by the level of the competitors. It’s a wonderful competition. Atmosphere is incredible and love is all around. It is extremely obvious that this competition has been composed with true passion and love to music. I am fascinated with Georgian people, you are exceptionally warm. Hope to visit this country again in future. I am fascinated by the hospitality of the Georgian people and high level of organization of the competition. Difficulty of the Tbilisi International Piano Competition is worth emphasizing – enduring 4 rounds both psychologically and physically speaking is an enormous challenge for young musicians. Exceptionally young age and yet, mature pianism is eye-catching. This competition unlike many others consists of 4 rounds. It differs by rich and multicolored program which gives contestants a possibility to reveal themselves up to maximum. As for the contestants, here we have seen different “handwritings’, diversity of piano schools, though each contestant has had its own failure. None of the competitors could evenly go through all rounds, and accordingly the Grand- Prix- First Prize wasn’t awarded. Generally speaking I think that all contestants should be able to play the first two rounds through, which would give them a better chance for self-expression.I would like to mention for purpose- sometimes we forget, that success of contestants directly depends on their mentors. We have faced a great pedagogical work and this is their achievement as well. That is just what I would like to congratulate all pedagogues with.